Dimensions: 6" high x 10" wide. Constructed of high quality aluminum with weather resistant coating. Alarm System Warning for High Water Temp and Low Oil Pressure. Tachometer with built in digital hour meter. Key switch, Momentary Switch for Aux. and night panel light switch. Plug in extensions available in 5’ 10’ 15’ & 20’ . Engine harness requires that supplied terminal ends be fitted on some engines. 15' extensions and over, relay recommended to avoid voltage drop. Can be supplied with order. In the case of single terminal senders & switches, (as used in standard ground installations), do not use Teflon tape or paste when installing, the threads provide the necessary ground connection. Tape or paste can cause poor connections causing gauge or alarm to register erratically or not register. If you wish to check your sender/switch is making a good ground connection, temporarily connect an independent ground wire. Make contact from the engines main ground to the threaded outside case of the sender. Compare gauge readings with and without the extra connection, they should be the same. If so, this will confirm your sender/switch is making a good ground. It is important to match the sender to the gauge and likewise the gauge to the sender. Not all gauge manufacturers function on the same variable resistance. 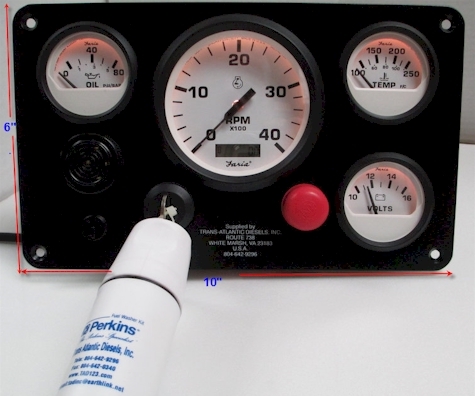 A mismatched gauge or sender will produce an inaccurate temp or pressure reading. If your vessel has an upper and a lower operating station with 2 sets of gauge panels per engine, then special dual station senders are required. Please be careful to state this when ordering. 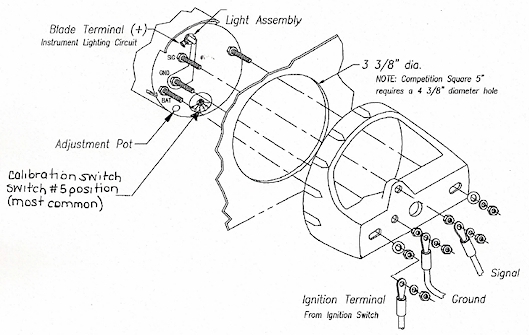 To order either a loose gauge or sender for an instrument panel not supplied by TAD Inc. it is important to give us as much information as possible, the brand name of the gauge and the NPT (National Pipe Thread) size of the sender see chart below, If you are uncertain and can not check your NPT size it is recommended that you select the smaller NPT size. A reducer bush may then be used to adapt to a larger NPT size if required. Indicate if the sender has 1 or 2 terminals. 1 terminal is normally for a Standard Ground sender, a 2 terminal sender is normally for a floating (isolated) Ground system. The scale of the gauge is important. Example 0psi – 80psi (1bar -5bar) for the oil pressure and 100 deg. f – 250 deg. f (38c – 120c) for the water temperature. Diameter of hole gauge removed from. If we are not able to identify your old unit we can usually supply you with an alternative new matching gauge and sender. Some of the popular manufacturers are: VDO – Faria – Datcon – Stewart Warner – Teleflex – AC (Not all currently available). When ordering alarm sensors these are referred to as switches. (They make and brake contact sending a warning signal to the alarm device) These switches are more generically similar. The variation is usually in the setting at which the contact is made and alarm will sound. In most cases there are 2 switches on the engine one indicating high water temp and the other, low oil pressure. In order to supply a replacement alarm switch, we will need to know location on engine and purpose of switch, the thread size and # of terminals. See NPT thread size chart below. Most modern tachometers operate off of the AC connection on the engine’s battery charging alternator. As the engine speed increases and decreases it varies the AC output reading to the tachometer. These units offer a stable reading, are reliable and virtually maintenance free, unlike the old cable drive units. It is however important to ensure correct alternator belt tension is maintained. Belt slippage will result in a low erratic reading. These units will require a one-time calibration when installed. This is normally done with the aid of a hand held tachometer reading from the crankshaft pulley. If you have any questions regarding harness connections, please call us for assistance. Remember an incorrect connection could cause damage. As supplied by Trans Atlantic Diesels Inc. 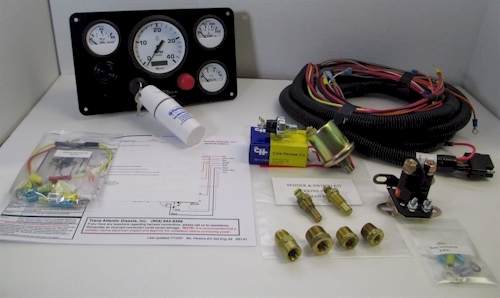 This can be used to avoid voltage drop to the cold start aid (Flame start). For Faria Euro White & Datcon Panel. As supplied by Trans Atlantic Diesels, Inc. For Perkins 4.108, 4.236, 6.354, & others (using Delco 7127 alternator). Suitable for standard ground electrical systems. As supplied by Trans Atlantic Diesels, Inc. This can be used to avoid voltage drop to the starter motor solenoid. Mainly used with extension harnesses over 15 ft.
BLACK #10 Ground - Connect to ground post on alternator, starter or engine block. RED #10 Positive Feed to Panel - Connect to positive + main large terminal on starter (some earlier models had blue strip on red wire). YELLOW w/ RED STRIPE #14 Starter Solenoid - Connect to solenoid starter engage terminal on starter (small terminal). Should connect through neutral safety switch on transmission where applicable. GRAY #16 Tachometer - Connect to tachometer output terminal on alternator. WHITE w/ BLUE STRIPE #16 Exciter - Connect to alternator excitation terminal on back of alternator. This provides 12v excitation from the key switch. LIGHT BLUE #16 Oil Pressure - Connect to oil pressure gauge sender. LIGHT BROWN #16 Water Temperature - Connect to water temperature gauge sender. ORANGE #16 Alarms - Connect to low oil pressure alarm switch sensor and link to high water temp alarm switch sensor. Both must be linked to same orange wire. PINK #12 Extra Wire - Cold start or electric stop as applicable. Perkins 4.108 pink is for cold start. RED #10 Main Alternator Output Terminal to Battery/s - For standard alternator, 65 Amp or less, connect to positive + main large terminal on starter motor to main output terminal of alternator. Read note below when utilizing a high output alternator (over 65 Amp). Customer should supply and fit a larger wire from the output terminal on the alternator to the battery/s directly or via main Positive terminal on starter motor. Wire sized according to output and length of wire. If the alternator is isolated ground then the size of the ground wire should also be increased. Contact alternator manufacturer for recommendations on wire size. Standard # 10 Red wire in harness is only suitable for standard 65 amp alternator. IMPORTANT: Using too undersized or incorrect wire could cause a fire hazard. National Pipe Thread sizes do not refer to physical dimensions. The Outside Diameter (O.D.) of each pipe or fitting must be measured and compared with the table shown for size identification. MALE THREAD O.D. FEMALE THREAD I.D. 3/4" 14 1 1/16" 15/16"
1" 11 1/2 1 5/16" 1 3/16"
1 1/4" 11 1/2 1 11/16" 1 17/32"
For more details download our Pipe Thread (NPT) Sizing Chart.